Preheat the oven to 200ºC, gas mark 6. Cut 400g Waitrose Icelandic Cod Fillet (from the fish counter) into 4, place on a baking tray and drizzle over 4 tbsp sweet chilli sauce. Bake for 15 minutes. Meanwhile, heat 1 tbsp sesame oil in a large frying pan, add a 300g pack essential Waitrose Vegetable Stir Fry and fry for 5-6 minutes. Meanwhile, cook 250g Waitrose Medium Egg Noodles in boiling water for 4-5 minutes, drain, and add to the vegetables for the last minute. Stir in 2 tbsp soy sauce and pour over the excess chilli juice from the fish. 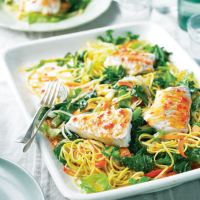 Serve the fish on top of the noodle stir-fry. This recipe was first published in Wed Sep 14 11:10:00 BST 2011.